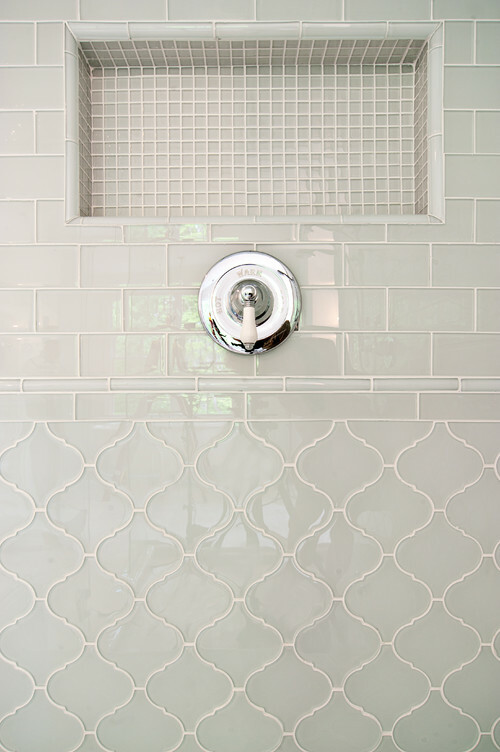 Home » Decor & Design » Other » Arabesque Tile – 2016 Tile of the Year! Delving deeper into the 2016 interior trends, I thought that you all would appreciate a more thorough look at the arabesque pattern. Although an arabesque pattern can be any decorative pattern of an intertwining nature, in the design world it is quite unique, but easily recognizable. Most often, the pattern will be seen in tiles. 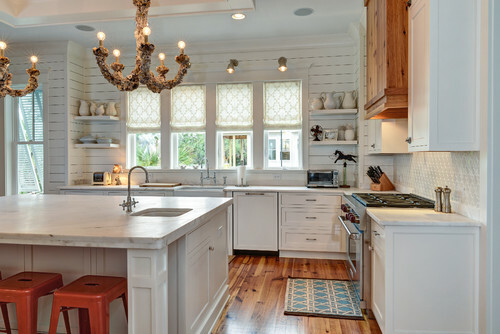 In the image above, the kitchen backsplash consists of a neutral, beveled arabesque tile. 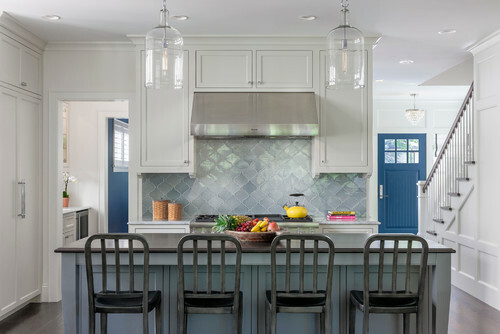 These arabesque tiles help to tie the blue from the island to the blue of the door on the right and the wall on the left. This can be accomplished by either purchasing a tile that has a color variation, or by mixing several hues from within the same color. A different view, of the kitchen from above, shows a bit more of the crisp but soft color palette. 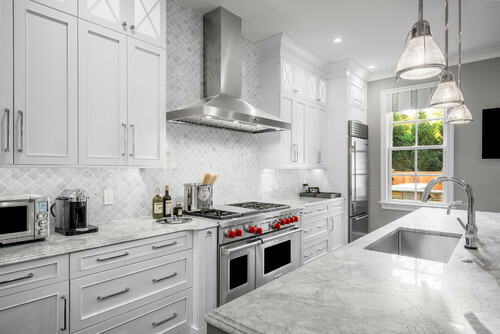 The soft gray of these tiles looks very nice with the marble countertops and the clean white cabinets. With this design, it is easy to see how the arabesque tile can become a classic in its own right. With a monochromatic design like this one, texture is of great importance. 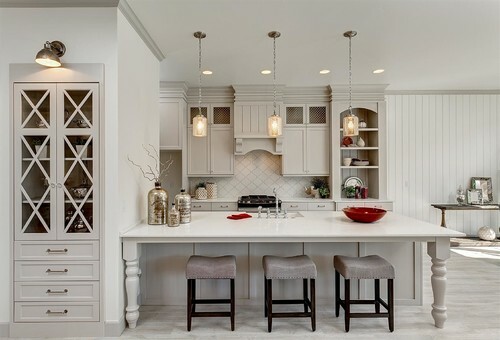 Having the arabesque tile for the backsplash works well with the vertical paneled walls and the board and batten styled island front. While keeping true to the “shades of taupe” color scheme, the tile gives the eyes a break from the many vertical and horizontal lines. Arabesque tiles can add a nice alternative to a solid subway tiled surround. Mixing the two can add some pizzaz to the design. Consider using arabesque tiles as an accent wall. This works great behind a vanity. (Notice the pastels create a serene, spa like setting). 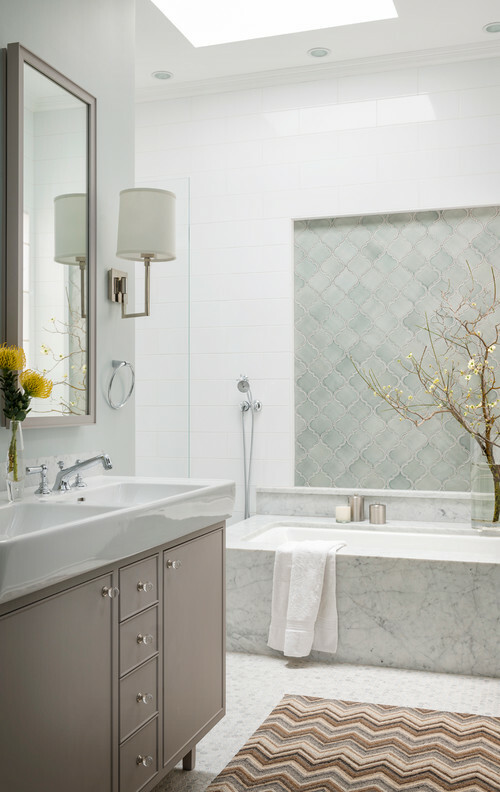 Here, these watercolored tiles have been used to create an accent behind the tub. This is a great idea if you are working on a tight budget. Notice that the remainder of the wall is done in a basic white subway. That can help to cut down on expenses. 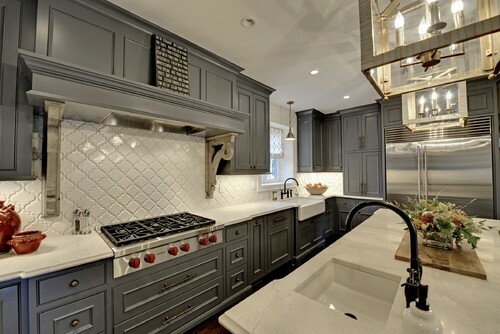 Plus, the plain white, subway tiles allow the arabesque tiles to become the focal point. These gorgeous tiles from Artistic Tile & Stone create a modern day traditional styled bathroom. I love the way that they used the same tile color, but created such an interesting design by simply changing the pattern. Although I did not include it as a trend for 2016, metallics is definitely going to see a big comeback this year. 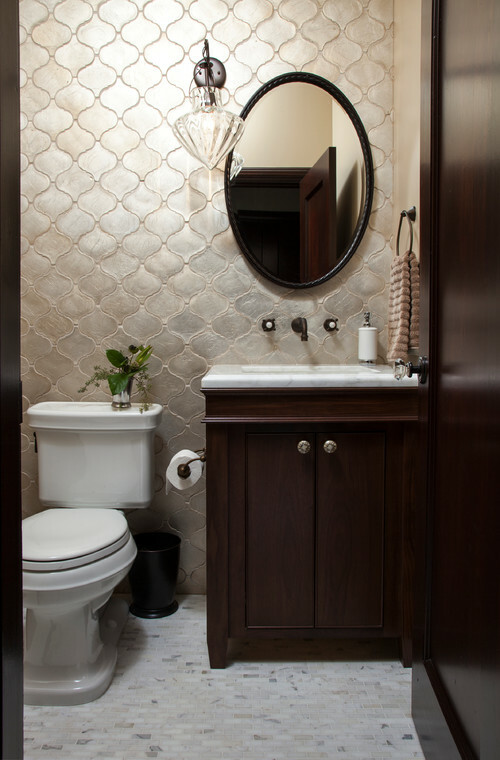 As demonstrated by this arabesque tiled powder room, metallic tile can give an elegant, almost wallpaper’ish, look. 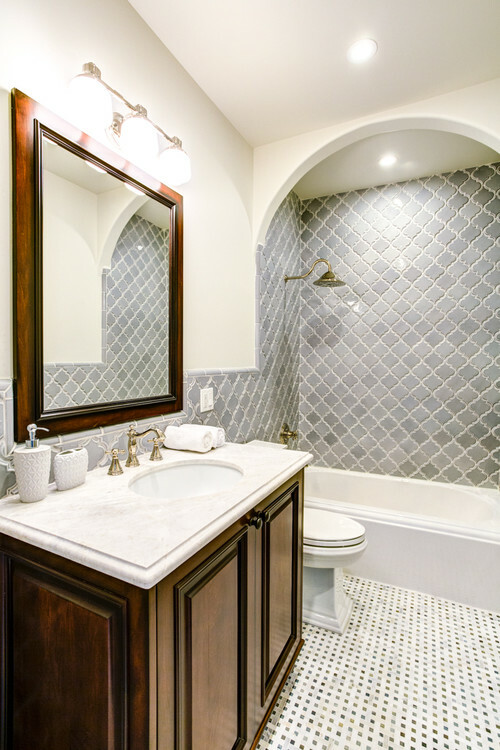 If you like the look of the arabesque pattern, but you are just not willing or able to go for the tile, there are still several ways that you can incorporate it into your design. Consider an area rug. 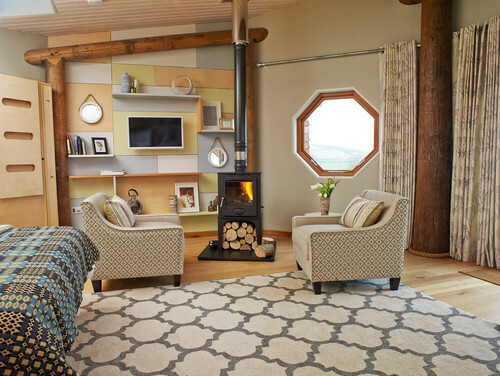 This rug style has nearly pushed the chevron pattern completely out of the mix. 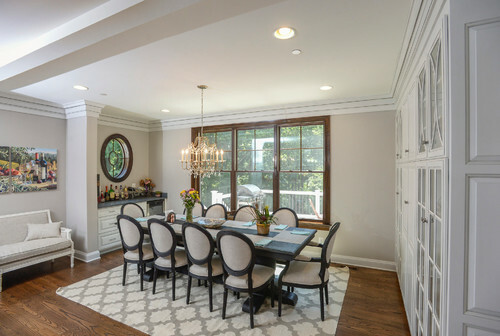 Here again, the area rug done in an arabesque pattern looks very elegant in a dining room as well. So, don’t feel like the pattern is restricted to just the kitchen or the bathroom. Another great place for this pattern is the windows. Consider adding blinds done in an arabesque design. When I saw this room, (bedroom converted to a home gym space), my eyes were immediately drawn to the mirrors. I can easily picture these mirrors as the focal point of a room. As it stands, it looks like someone left behind all of the beautiful decorations, when they started changing this room over to a gym. I felt compelled to include these arabesque lampshades that I made over. I am in love with the pattern and decided to turn my plain white lampshades into something a bit more current. If you’re interested in the how to, check it out here.